We spent a month living in Bucharest, Romania and a few weeks traveling through Transylvania. During our time there, we learned how to get by as tourists and as ‘locals’. With the goal of experiencing the country to its fullest, with everything it has to offer, yet saving money where possible, we learned a lot about Bucharest and Transylvania, Romania. Whether you’re visiting for a few days, or staying for a month or more here’s a few tips we picked up along the way that may help you on your travels! Bucharest (‘București’ in Romanian) is the capital of Romania and it's located in the southeast of the country. Find the city by its coordinates, 44°25′57″N 26°06′14”E, or see it on this Google Map. Bucharest is located on the Dambovita River (‘Dâmbovița River’ in Romanian) and is just under 40 miles north of the Danube River. Also, in case you’re wondering, Bucharest is 272 feet above sea level. The Henri Coanda International Airport (‘Aeroportul Internațional Henri Coandă București’ in Romanian) is the official name for the Bucharest airport, but it's commonly referred to by it’s former name, Otopeni (abbreviated OTP). The airport is approximately 11 miles from city center, but with city traffic driving can take 40-70 minutes during rush hour. There are four seasons in Bucharest, winter being the least desirable time to visit the city. Snow isn't uncommon and January is typically the coldest month of the year with temperatures dropping below freezing. Daylight during the winter is limited as well because you'll have the shortest days of the year. On the opposite end of the spectrum, summers can get very hot. July and August are the hottest months in Bucharest, with temperature highs breaking 100º Fahrenheit, but generally staying in the high-80s and mid-90s. However, the sun sets around 9 pm during the summer, giving you plenty of daylight hours. To avoid the extremes or summer and winter, we recommend visiting in spring and fall. The temperatures are moderate and there’s still enough daylight to do plenty of exploration of the city. Accommodations in Bucharest are generally less expensive than in other European cities. We found the best deals for living like a local when searching Airbnb (use our link and save $40 off your first stay!). However, you can of course choose from hostels or hotels. As with any city, the closer to downtown you stay, the closer you’ll be to attractions and city nightlife. It’s always a balance for us, as the closer we stay to downtown, the more expensive accommodations are, but on the other hand, we spend less on transportation. There are various neighborhoods, also called ‘sectors’, in Bucharest that we’d recommend staying in. Sector 3: Unirii Square (‘Piața Unirii’ in Romanian) – This is the central and southeast portion of city center. This is where you’ll find hostels and various hotels that range from budget to luxury. It’s also where the main metro lines intersect, making Unirii Square a central location to get anywhere in the city the metro runs. Old Town (‘Centrul Vechi’ in Romanian) – This is the place to stay if you want to be near nightlife in Bucharest. It’s also where you’ll find the highly recommended, traditional Romanian Restaurant Caru cu Bere. Old town is about as central as you’ll get in Bucharest. Sector 2: Bulevard Dacia – Located in city center east, this is one of the more affluent residential neighborhoods. It’s full of architectural charm, as many of the older buildings weren’t destroyed to make way for communist buildings. Sector 1 – Located in city center north, this area is where the Romanian Triumphal Arch (Arcul de Triumf in Romanian) is located. It’s a highly sought after, modern area of the city. Accommodation is, as expected, a bit more expensive in this area. Sector 5 – Located in city center west, this is where the Palace of Parliament is located. There are many luxury hotels to be found in this sector, as dignitaries and political figures stay near the Palace of Parliament. Shopping at discount grocery stores can save you a bunch of money on food! When looking for the best store, keep in mind that some chains have smaller markets, often called something like 'express', 'local', or 'shop 'n go'. These smaller versions of the larger grocery store are generally more expensive and carry fewer items. Budget travelers will save money on meals by eating at local 'fast-food' shops and Patiseries (pastry shops). There's no shortage of them, so they're easy to find anywhere in the city. You wont need to go very far to find small, independent fast food places. They're usually take-out only and often times you'll order from the sidewalk through a window or over a counter. Depending on the place, they'll have fried foods, traditional Romanian dishes, or kebabs. They're inexpensive food options and we recommend following the crowds and eating at the places with locals lined up at lunch time. Fresh and local produce will be the least expensive options for making your own meals and snacks. Near city center, we found Piata Obor. It’s a huge produce market with fresh fruits and vegetables. During our visit, berries were in season and we indulged on cherries that were as low as 4 LEI a kilo. That roughly converts to $0.50 a pound (at the time of our visit)! Piata Obor on the ground level was an indoor and outdoor produce market, with local Romanian farmers selling all sorts of in season vegetables, fruits, and nuts. Plus, if you go up the escalators to the second level, there are a variety of shops that sell everything from meats and cheeses to spices and natural/organic products. Visit in the summer and you won’t have to walk very far before you find a tree bearing fruit. Our visit was in June and July and we found cherries, plums, and what we think were mulberries. We found plenty of trees that were on public sidewalks, so, from what we could gather, free to pick. However, often times the low hanging fruit had fallen to the ground, leaving mainly the hard to reach fruit. The easiest way to find these treasure bearing trees is by looking down, not up. It’s easy to miss small berries amongst the leaves of a tree, but it’s very hard to miss the ground when it’s covered in berries that have fallen. Foraging is perhaps for the more daring, but very do-able. In the summer, fruit trees are easy to find! If you're looking for a tree that bears fruit, it may not be intuitive, but look down, as you'll see fruit spread out on the ground under the tree. Churches and monasteries are generally free to enter. They’re fantastic places to visit, as they hold hundreds of years of history and culture within their walls. Walk the city and you’ll be treated to all types of architecture. Modern buildings are built next to communist dormitory buildings, which are next to palaces and ornate medieval buildings. There are great parks all around city center and they’re, of course, free to enjoy. If you’re up for a free movie, visit Herastrau Park on a summer weekend after sunset where they show a movie on the large screen in the center of the park near the entrance. We have a bunch of resources in our toolbox when it comes to finding inexpensive lodging. In Romania, we found that Airbnb was a fantastic option. We stayed for a month and found a studio apartment for $14.30 US dollars a night. That’s a tough deal to beat! We had a great internet connection (100 Mbps down and 20 Mbps up), a kitchen, and the whole place to ourselves. However, it was far from luxury. You’ll probably be able to spend $5 or so more a night to get a very comfortable room or apartment, if you choose. Use our Airbnb link and get $40 off your first stay! There’s no way to pack for every situation and you’re bound to run out of supplies. Some things you can find at the mall or in ‘hypermarkets’, which are similar to Walmart, Fred Meyers, and Target in the United States. Hypermarkets are stores that sell everything from groceries to clothing, but unlike the US, where they’re one stop shops, you’ll be surprised to come up empty handed on a few essential items. Vitamins: Only a couple of basic vitamins can be found at hypermarkets and similar stores. If you’re looking for something beyond multivitamin or magnesium tablets, you’ll need to head to a pharmacy (‘farmacia’). We needed to stock up on B vitamins and Iron supplements and could only find them at pharmacies. We recommend writing down the type of vitamin you’re looking for. If it’s a ‘letter’ vitamin, just write it down, or use a translating application to find the name of the vitamin in Romanian. For example, B12 is universally ‘B12’ (with exception of languages that use a different alphabet, of course). However, iron in Romanian is ‘fier’. Contact Lens Solution: There’s only so much we can pack in our quart sized liquids bag since we travel only with a carry-on backpack, so it’s no surprise we found ourselves needing to buy contact lens solution on our visit to Bucharest. 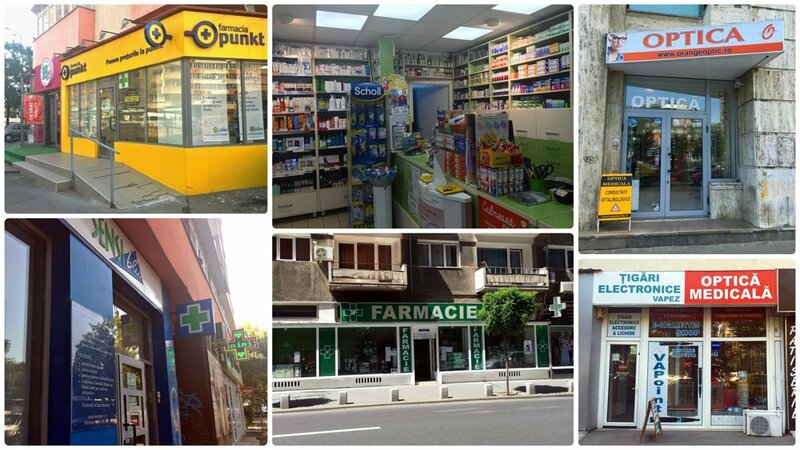 We looked at small markets, hypermarkets, and pharmacies, but couldn’t find any. Finally, someone pointed us in the right direction; it turns out you can only purchase it at optical/vision stores. We tried a few stores and found that larger optical centers, those that sold glasses and performed vision checks, usually carried one or two brands of contact lens solution. Pain Killers (non-narcotic): Don’t expect to find pain killers, such as aspirin and ibuprofen, at a corner store or hypermarket. Instead, make your way to a pharmacy (‘farmacia’) to find them. Fortunately, they’re over the counter, so no prescription is needed. Medication: Many medications that are prescription only in the United States can be purchased at a pharmacy (‘farmacia’) without a prescription. We’re traveling for a whole year, so we were running low on a couple of medications that we had prescribed to us by a doctor in the US. Since prescriptions written by doctors in the United States aren’t valid in other countries, we thought we’d need to see a local doctor for a Romanian prescription. However, since we had nothing to lose, we checked at a pharmacy to see if we needed a prescription for the medications we were low on. To our surprise, it turned out we could simply buy what we needed over the counter. We recommend having the name of the medication and strength needed written down. The pharmacist will most likely be able to understand what you’re looking for by reading it, since many medications have similar names in different languages. It’s also wise to know what the generic name for the medication is, as opposed to the brand name. If the pharmacy doesn’t carry the strength you need, consider taking more than one pill, or cutting a pill in half to get the correct dosage. We aren’t medical professionals and are in no way providing medical advice. Contact a doctor or medical professional before taking any medication, vitamin, or supplement. Unlike the US, pharmaceuticals and other 'odds and ends' can't be purchased at a supermarket or drug store. If you're looking for contact lens solution, you'll need to find an optical/vision store. Medicines, including over the counter medications and vitamins, are only available at pharmacies. The language in Romania is Romanian. Not having much exposure to the language before we arrived in Bucharest, we were surprised that Romanian is similar to Italian, Portuguese, and Spanish. Since we both know Spanish, we had a basic understanding of Romanian, when it was written. On the other hand, when it was spoken, that was a different story, as the pronunciation was nothing like we’d expect it to be (based on our Spanish). If you need to speak with someone and you’re not sure if they speak English, it’s always a good idea to ask if they speak English, instead of assuming or expecting them to. It’s a common courtesy that'll probably be appreciated. If you’re looking for directions or have a question, look for someone younger to ask. Young people are more likely to speak English, although we encountered many people of all ages that spoke English. While you can usually find someone who speaks English, it’s a good idea to learn a few words in Romanian. As one example, we learned how to say thank you (mulțumesc) and it was extremely helpful. Each time we used it, we usually received a genuine smile and appreciation for the effort we'd made. The local currency is the Romanian Leu, of which the plural is Lei (pronounced ‘lay’). So when your shopping you’ll see currency referred to often as Lei, not as Leu. You’ll also see it written as RON, since that’s the abbreviation of the Romanian Leu. It can be a bit confusing, but just remember that Lei and RON are the same thing. Bank notes come in denominations of 1, 5, 10, 50, 100 and 500 lei. Coins are in 1, 5, 10 and 50 Bani pieces (pronounced ‘bahnee’), and 100 Bani equals 1 Lue. During our visit the exchange rate was roughly 4 Lei to $1 US dollar. Romanian currency in both coins and bank notes. It may have been because we’d just come from Norway, which was the most safe we’d ever felt walking around vehicular traffic, but we did feel that we needed to really be on the defensive when walking around Bucharest. Drivers aren’t always looking for pedestrians and if they don’t see you, they’re going to keep going, even if you have the right-of-way. Look twice when stepping off a curb and even if you have a green light to cross the street, make sure the oncoming drivers see you. In city center, we didn’t have any concerns finding cross walks, pedestrian signals, or sidewalks. It was common to have a wide sidewalk with a brightly painted lane for cyclists. However, it was just as common to have a narrow sidewalk, with half of it being used by parked cars. Be careful walking, potholes are common, and cobbled or tiled stones may be loose and wobbly. When descending stairs or stepping off the curb, use extra caution. We often found that tiles on stairs, or stones and concrete used on curbs were loose. Many streets, particularly in old town, are cobblestone. While cobblestone streets set a great atmosphere and look great, they aren’t the best for walking. Be sure to step carefully and not twist an ankle! Conditions of streets, walkways, and paths vary greatly throughout the city. The streets and walkways we came across ran the gamut from cobblestone, narrow walkways, and wide two-lane paths. Bikes can be rented all over town from i’velo stations, be sure and check locations and pricing details on their website. The question of water safety is a bit of a debate. Some say that it’s plenty safe to drink the water, while others say it’s smart to be cautious and stick to bottled water. We checked with IAMAT, and while they say the water is safe to drink because it’s chlorinated, there’s still a chance of foreign strains of e. coli in the water. We stayed at an Airbnb in a downtown apartment building and noticed right away that the drains smelled. Just to be on the safe side, we decided to drink bottled water and avoid any chance of getting sick. We purchased 5 L bottles of water (for reference, a US gallon would have 3.78 L of water) from the grocery store. We found water for as cheap as 0.38 Lei per littler. Alternatively, a great way to get clean water without spending money on bottled water (and reducing the use of bottles) is the SteriPEN. It uses ultraviolet light to sterilize the water, which ensures bacteria isn’t able to multiply, making tap water safe to drink. Here’s a great comparison chart that you can use to pick the best SteriPEN product for your needs. Alternatively, you can use a LifeStraw which also purifiers water. It’s especially great for hikers because it’s rugged, lightweight, and requires no electricity or batteries! Here are a few world-wide tips to avoiding tummy aches and sickness from contaminated water consumption. Again, how closely you follow our tips (if at all) depends on your personal sense of adventure, where you’re traveling to, and the current water quality of the location your visiting (see below). Make sure the bottle is sealed when you get it. It’s possible, that to save money, the bottle was refilled with tap water. Don’t eat fresh vegetables and fruits. They’ve probably been washed with tap water. It’s okay to eat cooked veggies, and fruit that you eat by peeling and discarding the skin. Keep your mouth closed when swimming in open bodies of water. Keep your mouth closed in the shower. It’s never a bad idea to drink your beverage straight from the bottle or can, to avoid the glass that was cleaned with tap water. For a quick reference on where it’s safe to drink the water, check out mappingmegan.com. Take it a step further and find out if what you're eating is safe by downloading the CDC's 'Can I Eat This?' app for your mobile device. The CDC also has an app that, based on your specific destination, will give you a list of vaccination recommendations. It has calendar reminders for vaccine boosters shots, travel packing lists, and stores important medical and immunization records. While doing research on Bucharest, we read the warnings about stray dogs throughout the city. They’re said to be a problem and ridden with rabies. However, we rarely saw stray animals. We did see a few stray cats here and there, that seemed to be fed by locals, but it was rare. It seems there was a project deployed in 2005 to round up over 1 million stray dogs. In our opinion, it seems to have worked; despite the warnings, we didn’t encounter very many stray dogs. If you do see any, be aware, getting bit by a dog should be a mandatory and immediate trip to the hospital for rabies treatment. Be careful of overhead wires. Codes in Bucharest aren’t what they are in the United States and most European countries. This is evident when looking up at telephone poles and seeing hundreds of feet of cable disorganized and hanging from the pole. It wasn’t uncommon for us to see cable, perhaps even with a live currant running through it, hanging from the pole and laying on the ground. Walk with caution, and don’t step on or bump into the cables. It’s better to be safe than sorry. Perhaps regulations are a bit different in Romania than they are in the US? Plastic shopping bags aren’t free. We travel with reusable shopping bags, because they reduce waste and in most places in Europe, bags aren’t free. While cheap, small plastic bags are only a few cents, we’d like to save the spare change and also reduce our impact on the environment. Between our daypacks, two re-usable shopping bags and two re-usable produce bags, we’re able to purchase and carry our groceries without much problem. If you need to purchase bags, be sure to hold on to them for the entirety of your visit to save money and reduce waste. Romania is part of the European Union, but it’s not (yet) part of Schengen. This makes it a great place to spend some time if you’re a long-term traveler. Schengen is an agreement of 26 countries that, for traveling purposes, share the same visa policies. Citizens of these included 26 countries are able to travel freely between member countries, in theory, as if they were one country. For those who aren’t citizens of a Schengen country, and like us, are from the United States, it means visa free travel within all Schengen countries. Within a 180 day (six month) period, we can be in Schengen for a cumulative 90 days (three months). Now, please keep in mind two things. One, this is a simplified explanation of a more complex international policy. Two, Romania is likely going to become part of Schengen in the near future. It would be wise to double check Schengen policies, as well as specific country policies, for travel and visas specific to your country of origin. For US citizens we recommend Travel.State.Gov. We spent a total of six weeks in Romania, four of which were in Bucharest and two were spent traveling through Transylvania (mainly in Sighisoara). We enjoyed living like a ‘local’ and feel that we very much got a perspective on the area that most tourists don’t see. However, we’re sure there are things we missed, as we didn’t see all of the country and six weeks really isn’t that much time. If you have any tips from firsthand experience, we’d appreciate your input. Leave a comment below! Romania was an amazing experience that we won't soon forget (if ever)! Clockwise (from the top): A manhole cover that's uniquely Bucharest's, looking over the Transylvania countryside from the Sighisoara Clock Tower, a selfie shot in the Scholars' Stairs in the Sighisoara Citadel, Romanian flags, peeking through to the country side in Romania.